Strong winds out of the east are causing localized flooding in the Rose Beach Line, Coho Street, and Bates Drive area in Rondeau in Chatham-Kent. Coho Street is impassable at this time while Rose Beach Line has flooding over the road but currently remains passable. 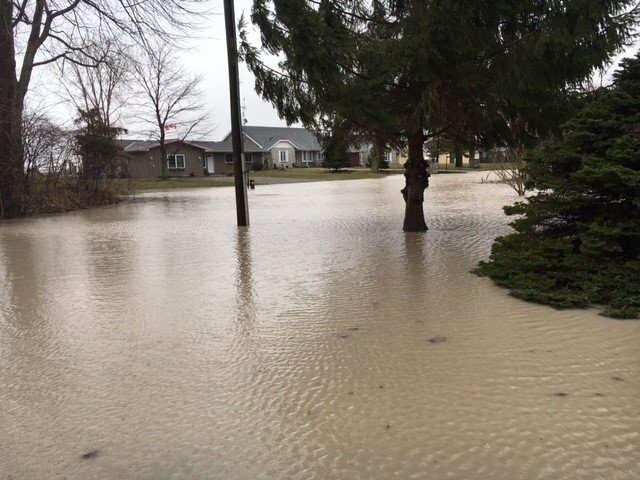 Erie Shore Drive is reportedly closed at this time and properties along Rondeau Bay in the Erieau area are also experiencing flooding and sand uprush. Environment Canada has issued a gale warning for Lake Erie reporting waves up to three metres in height which are expected to subside to one metre late overnight. Sustained winds are expected to peak later this afternoon around 57 km/hour with wind gusts up to 86 km/hour. Winds are expected to subside shortly thereafter and switch to coming from the south later tonight. Moving into Monday, winds will be out of the southwest and are expected to peak late Monday afternoon with forecasted sustained wind speeds of 42 km/hour and gusts up to 63 km/hour. The marine forecast is predicting waves building to two metres on Monday. Last year flooding had occurred along Erie Shore Drive in Chatham-Kent when the area experienced sustained winds above 35 km/hr from a southerly direction (southeast through southwest). Therefore, the forecasted wind speeds and direction are expected to cause flooding in this area again on Monday. There is a risk that wave action could damage shoreline protection works and cause shoreline erosion in vulnerable areas. Residents along the Lake Erie shoreline in the entire LTVCA watershed should pay attention to local conditions. People should take extra caution and avoid the shoreline should conditions get rough. The waves can be strong and the shoreline slippery. There could also be hazardous debris within the waves and water which could be thrown onto the shoreline. Standing water can also present its own unseen hazards. Children, pets and livestock should be kept away from the water. Officials will continue to monitor the situation and update this advisory if necessary.